We were excited to try Beast because we'd heard so many good things about it. It didn't hurt that Chef Naomi Pomeroy had been on Top Chef Masters and was a James Beard Award finalist. Maybe our expectations were too high. Maybe it was an off day. 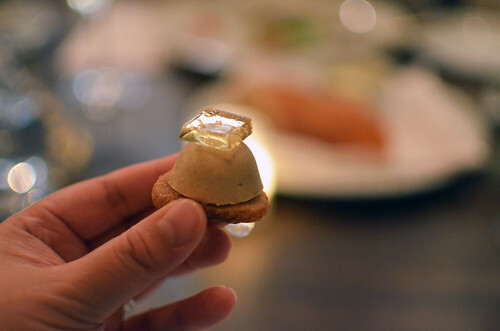 While the food at Beast was very good, it just didn't blow us away like our dinner at Aviary did the night before. Beast is small. 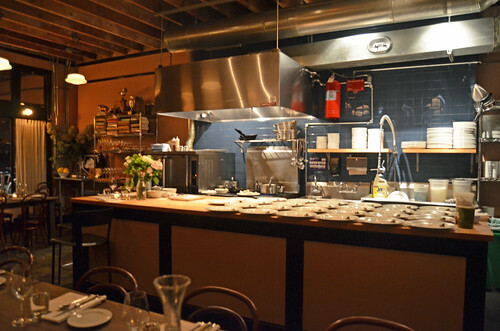 There are two dinner seatings each night, Wednesday through Saturday, and all dining is communal. What does this mean exactly? It means you have to eat with strangers, much to our dismay. I'm not sure why the restaurant makes no mention of this on its website. Well, I'll tell you about this communal dining here. 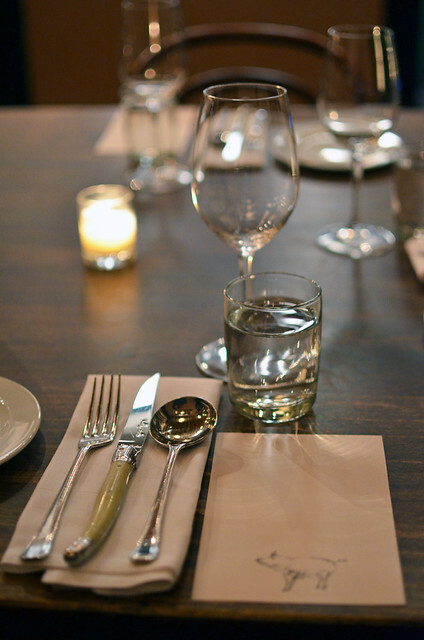 You'll be at a big table with a bunch of other people for your entire $75 six-course meal. If this isn't your idea of fun, I recommend skipping Beast. But, if you can stomach the idea of dining with unknown companions for a fairly long meal, welcome. Lucky for us, we quickly became friends with the young couple to our right. They were like mini versions of ourselves -- Asian, Californian, 10 years younger, and hungry for food and fun. Thank goodness for our little doppelgangers because the people to our left sucked. 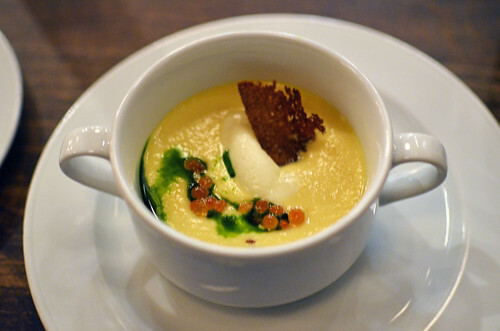 Heirloom cauliflower soup, leek and horseradish mousse, sake-cured trout roe and crisp rye toast. Pleasant start, although it wasn't very flavorful except for the roe. 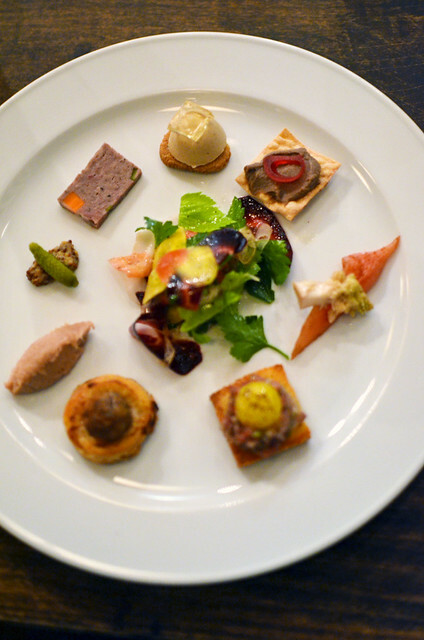 Charcuterie plate: foie gras bon-bon, Sauternes gelée, chicken liver mousse, leaf lard cracker, steak tartare, quail egg toast, rustic pork terrine, pork sausage en croûte, duck rillettes and tête de cochon. This plate of goodies was pretty impressive. I saved the foie gras for last, of course. 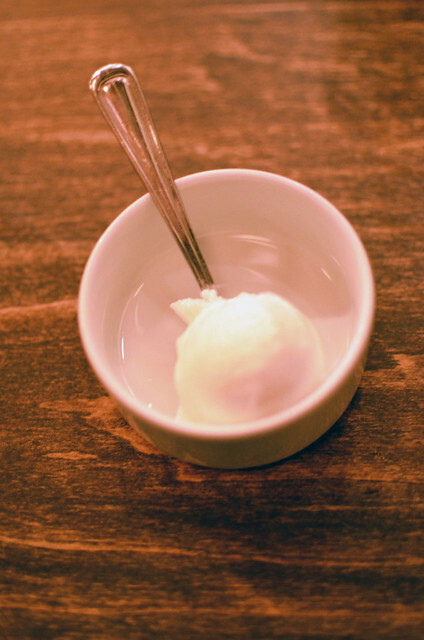 Palate-cleansing sorbet. Not much more to report. 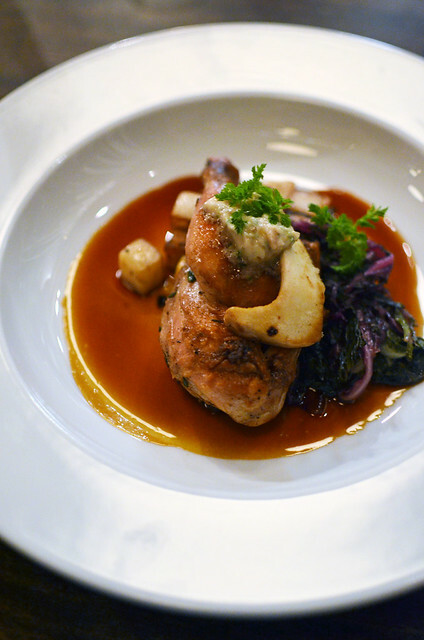 Fennel-brined poussin presse, caramelized gil-feathered turnips, peacock kale, herbed foie gras butter, porcinis, duck and rabbit jus. 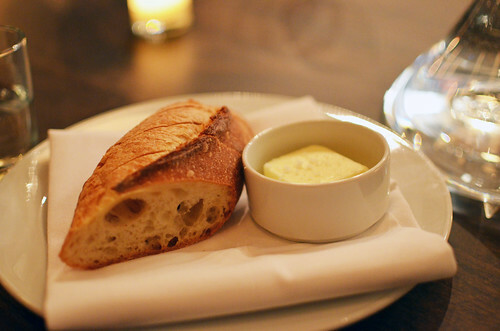 Pretty good chicken made even better with foie gras butter. But it was still just chicken. 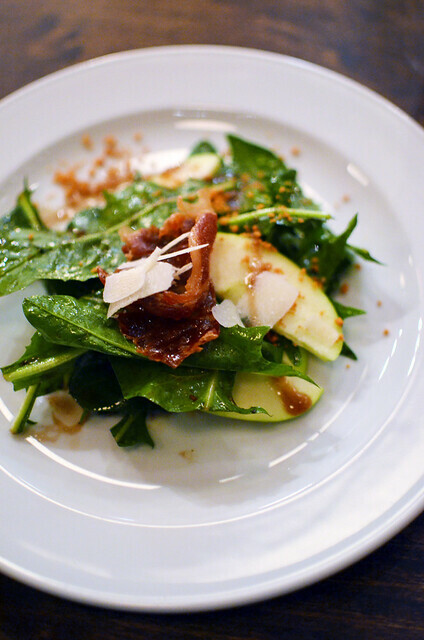 Square Peg Farm's catalogna emerald dandelion, Northern-Spy apples, crispy prosciutto, brown butter vinaigrette. I wish I could tell you that this salad was out of this world, but I can't. It was tasty enough. Definitely fresh. But nothing special. 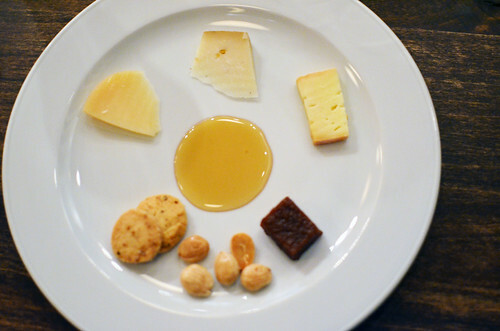 Selection of cheeses from Steve at Cheese Bar, fresh quince paste, fried Marcona almonds, bee pollen shortbread, wildflower honey. I can't lie. I like cheese, but I'm always disappointed when it's a course during a multi-course meal. Perhaps this makes me gauche. 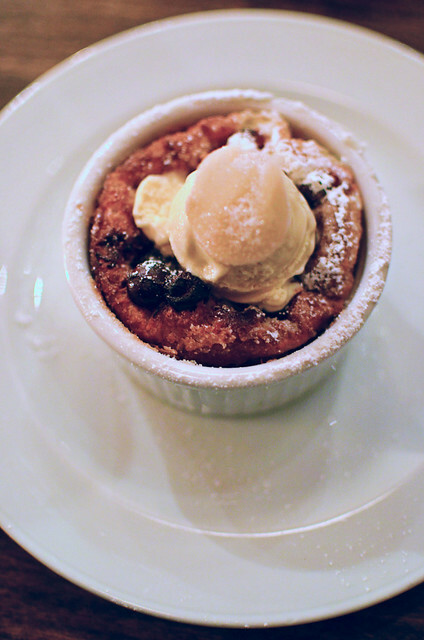 Bandon cranberry clafoutis, brown sugar-crème fraîche ice cream, candied ginger and walnut crumble. 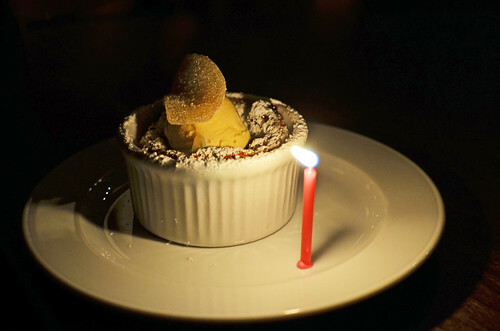 A candle for Mr. Monkey's birthday! Now this was quite a good dessert, and I'm a salty girl. Crumble gets me every time. Nummy. 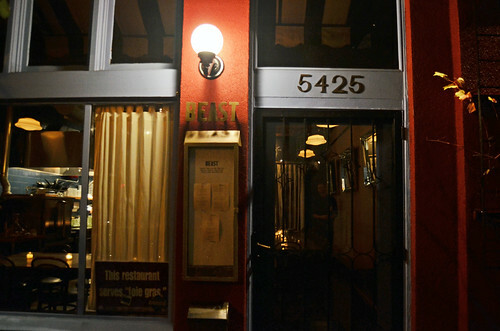 If you're looking for intimate private dining, don't go to Beast. If not, I guess $75 is a pretty swell deal for six courses, even when one course is just cheese. I can't wait to read more Portland reviews! Beast: we had dinner there once and I agree with your review. Communal seating was kind of strange too, but totally depends on your neighbors for sure! Aviary: we only had drinks there! Had no idea there was great food there! Beast should manage expectations. A simple note about communal seating on the website would be enough. Just knowing the setup would've made the situation more palatable. They probably don't mention it because they know most people are not interested in eating with total strangers. Not very cool. It must save the restaurant money? I have no idea. Either it saves the restaurant money, or they sincerely believe that forced socialization for over two hours is something patrons will enjoy. I cannot deal with multi-course communal meals. Shoot me. 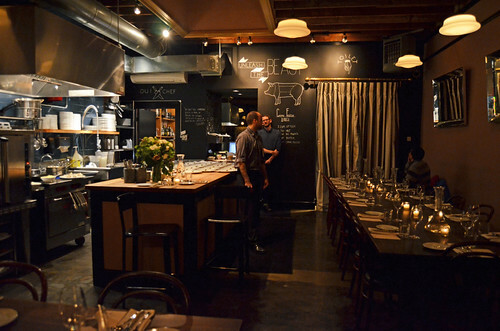 Yeah, tasting menus shouldn't come with a side of inane small talk. Le Pigeon did a cheese and honey course too. Cop out! The honey was deliciously smokey though. But still. I'm so glad your mini-mes were there to make the communal seating more bearable! I can't wait for the next Portland posts! I loved those crazy kids. I should dig out their business cards and let them know I FINALLY blogged! They would be your twins!